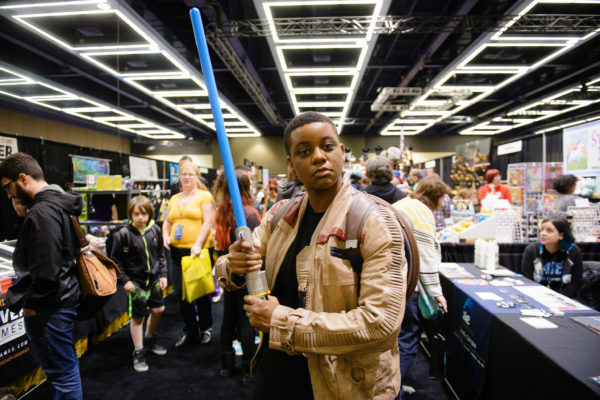 At our two-day convention on November 16 and 17, 2019, GeekGirlCon sets up an inclusive environment in the heart of downtown Seattle to celebrate every geek and honor the legacy of women contributing to science and technology; comics, arts, and literature; game play and game design; and beyond. Take a look below at what you can expect! GeekGirlCon takes place at the Conference Center at the Washington State Convention Center, located at 8th and Pike in downtown Seattle, WA. 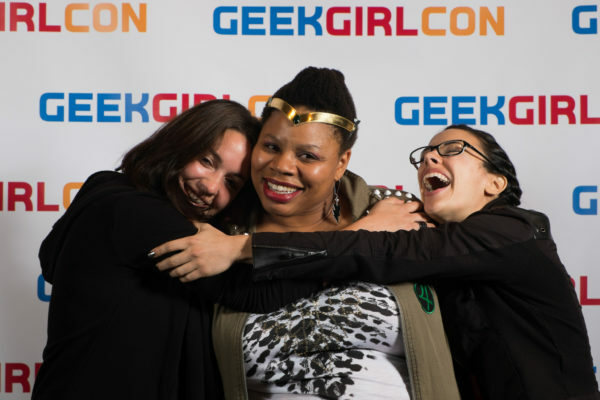 We want to make GeekGirlCon a super-cool experience filled with excitement, education, and fun for all. We strive to create an event that works for all our attendees. We think inclusively about the range of needs, employ best practices to continually review our spaces, improve as we are able, and learn from our mistakes. Read about some of the features and resources available at GeekGirlCon to make a comfortable space for everyone. Each year our programming content is a mix of community-organized submissions and staff-curated content, including content featuring industry guests. Look for panels on a variety of topics, as well as workshops to get hands-on. 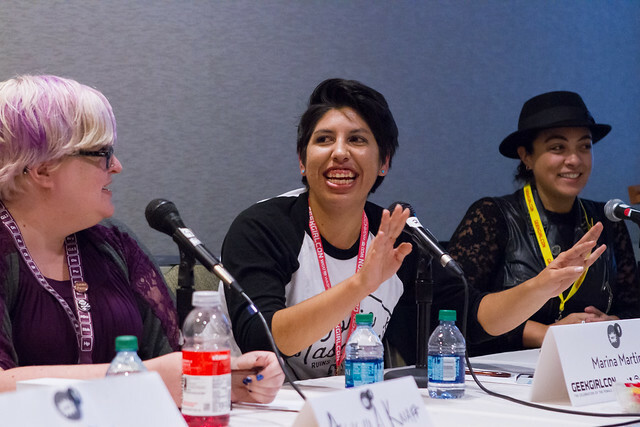 Panel from GeekGirlCon ’17: I Am Also a We – A Sense8 Panel. Photo by Sayed Alamy. A journey through GeekGirlCon’s Exhibitor Hall, you will find vendors with collectibles, comics, geek wear, prints, and so much more. In years’ past vendors showed off their custom-made TARDIS clocks, Lego earrings, glowing cat ears, LARPing gear, wands … we could go on. GeekGirlCon 2015 gaming floor at Washington State Conference Center in Seattle, Washington. Photo by Danny Ngan. BTW: If you need a break, find a quiet corner or pop up to Introvert Alley on Level 1 where you can just sit. And not talk. Celebrate the power of geek fashion with us as a diverse group of geeks walk the runway in outfits created by six companies. Learn about what inspires these designers, the changes they think the industry needs in order to become truly inclusive, and more! You won’t want to miss this night of fashionable, nerdy fun! Visit the DIY Science Zone, where our highly-trained team of scientists and science educators will guide you through a selection of fun experiments and answer all your questions about their scientific specialty. 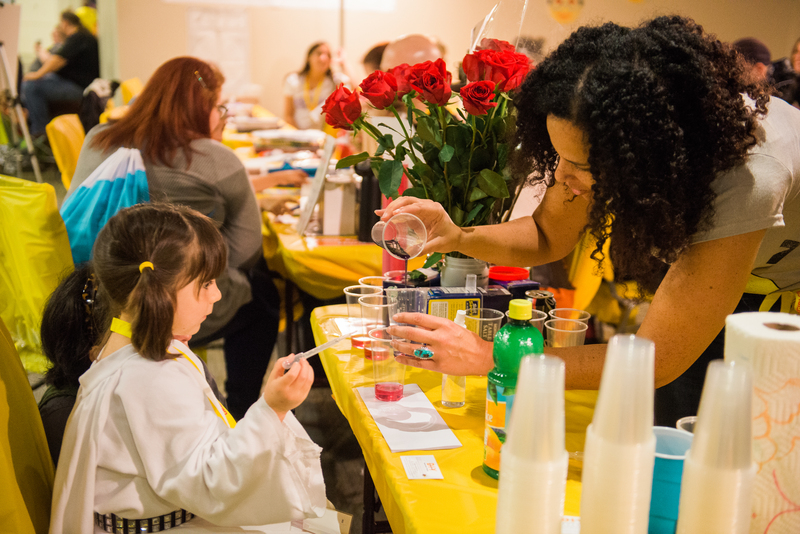 Thanks to all our DIY Science Zone donors that make doing experiments at GeekGirlCon possible! Consider supporting all of the hands-on science we have planned for 2019. 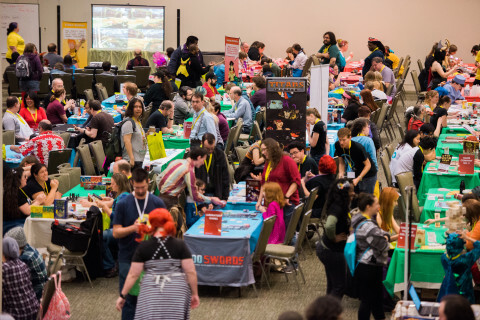 A look at the DIY Science Zone from GeekGirlCon 2015. Photo by Danny Ngan. GeekGirlCon is the place to shine in your geek finest. You’ll be able to join in our annual Costume Contest , Kids’ Costume Celebration, or just show off your work around the con. 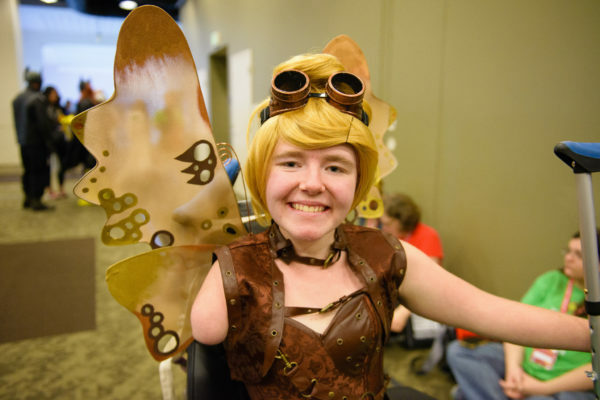 A GeekGirlCon attendee in cosplay at Washington State Conference Center in Seattle on Saturday, October 11, 2014. Collect stamps in your program book as you journey through GeekGirlCon. Each stamp earns you one entry to win a prize bag packed full of treasures from our vendors. The more stamps, the better your chances of winning! Collect all six stamps and receive a GeekGirlCon avatar pin of your choice. You can also get an avatar pin by filling out the Con survey. 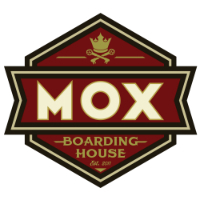 Complete both the Quest and the survey to receive two pins! Redeem your prize-drawing tickets by showing your stamps to the Agent at the GeekGirlCon Quest Table next to the Info Booth on Level 1 – Yakima. Don’t forget to get your picture taken by our fabulous photographers at our photobooth! All photos will be available on the GeekGirlCon Flickr page after the con! The Connections area at GeekGirlCon exists in order to create a space for like-minded community organizations, leaders, and producers to share their experience and work within our community It is focused on leadership development, mentorship, and connecting women with professionals in their desired career fields. What can you expect from a weekend at GeekGirlCon? Here are some social media comments from attendees. Can I just take a second to say how amazing @GeekGirlCon was? The sense of community and support was palpable. Thank you to everyone who made this con happen. These are just a few things you’ll see at GeekGirlCon. We will be making specific announcements about programming and events as we lead up to the con! So stay tuned. If you’ve been to our con, we’d love to hear about your experience! Join the conversation about GeekGirlCon on Facebook and Twitter.